The Waipiata Volcanics comprise a monogenetic volcanic field in East Otago. A paleomagnetic study was conducted on Mt MacKenzie, a maar-diatreme volcano of this field, to determine the emplacement processes of a massive lapilli tuff and a basalt dike. Samples were collected from the basalt and closely spaced samples were collected in a transect through the tuff perpendicular to the dike. Paleomagnetic techniques used included anisotropy of magnetic susceptibility (AMS), thermal and alternating field demagnetisation, and hysteresis and isothermal remanent magrnetisation (IRM). AMS data indicate flow fabrics in the tuff orient steeply upwards out of the volcano; this is interpreted to have formed as a result of a debris jet up through the tuff. Thermal demagnetisation data reveal two magnetisation components, with an inflection point at 110-230°C. Alternating field (AF) demagnetisation data show the same components, with an inflection point at 3-20 mT. The two demagnetisation components are inferred to indicate that the intruding dike completely reset the magnetisation of the tuff and both were later overprinted by a viscous remanent magnetisation (VRM). Hysteresis data show saturation magnetisations of 8.89 × 10-2 Am2/kg to 2.60 × 10-1 Am2/kg, remanence magnetisations of 3.39 × 10-3 Am2/kg to 6.19 × 10-2 Am2/kg, and coercivities of 3.04 × 10-3 T to 1.91 × 10-2 T, consistent with mineralogy containing magnetite and maghemite. They display decreasing coercivity and concentration with distance from the dike, which could signify hydrothermal alteration processes while the dike was still hot. 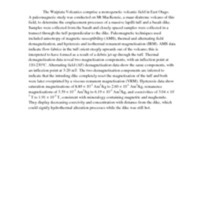 Mawson, Jasmine, “Paleomagnetism of the Waipiata Volcanics at Mt Mackenzie,” Otago Geology Theses, accessed April 22, 2019, http://theses.otagogeology.org.nz/items/show/636.